Whether you’re buying a yacht or selling one, a pre-purchase survey is a must. A yacht survey is often needed when you purchase a yacht, but in order to take full advantage of the survey you need a deep understanding of what’s being looked for, and what’s being discovered. Yes, you can gain some insight into the yacht in question with a self-survey (read Self Survey: Looking at a Yacht Yourself), but the professional pre-purchase survey is an entirely different beast. Professional pre-purchase surveys are often required when purchasing a boat or yacht – and with good reason. Let’s say you’ve found the right boat and have made an offer contingent upon a survey. Or you’re selling your boat and finally found a buyer who’s willing to pay the right price. Now all you need to do is get past the (often dreaded) survey. No matter which side of the negotiation table you’re on, you need to understand exactly what’s going on . For the surveyor, a deal hinging on a pre-purchase survey can be a tough assignment. The surveyor is hired by, and works for, the buyer. But the broker and owner are interested parties as well, and everyone wants the transaction to go through. Plus, the broker might refer clients to the surveyor every so often, and the seller might be a possible client for the surveyor when he or she buys their next boat. If all of this sounds like a potential conflict of interest, well, it can be. That’s why the Society of Accredited Marine Surveyors (SAMS) and National Association of Marine Surveyors (NAMS) organizations have codes of ethics for their members. Fortunately, there’s a clear path forward; every boat comes with a work list, and it’s a surveyor’s job to define what goes onto that list. It’s not the surveyor’s role to tell the buyer whether or not to buy, if it’s a “good deal” or not, or overemphasize problems. It’s worth noting, though, that owners are rarely surprised by problems or issues that are found during a survey. Generally speaking, they know their boat better than anyone. And as a buyer, remember, if you think pressuring the surveyor to overemphasize problems will help drive the purchase price down, you might want to rethink that approach. The report written for this survey will be the same one you send to your insurance company, and if there are too many issues it may prompt an expensive list of work that’s required before a policy will be issued. There are guidelines used in the survey that help the surveyor make many of the judgment calls, so he or she is not merely acting on opinions. First is the Code of Federal Regulations (CFRs), also known as the Coast Guard regulations. These cover minimal requirements for safety equipment, navigation lights, sanitation, engine, fuel and electrical systems on gasoline-powered boats. Diesel-powered boats are free from the mechanical and electrical regulations, but still must comply with the others. Close behind the CFRs are the American Boat and Yacht Council (ABYC) Standards, which are recommendations rather than regulations, but can carry significant weight—especially if an accident or failure ends up in court. The standards are extensive to say the least (in book form they weigh four and a half pounds), and they cover just about everything on a boat except the basic design and construction. Since the standards are so comprehensive many of the sections won’t apply to one individual boat or another, but most systems a surveyor sees on a boat will relate to ABYC in one way or another. Additional standards may come from the National Fire Protection Agency (NFPA), and in some specific cases, the surveyor might use other sources. For instance, it may be appropriate for a surveyor to judge the lifelines on a racing sailboat based on the Offshore Special Regulations, which set rules for offshore sailboat racing. Though anyone can hire a yacht surveyor for any reason, market forces have created a “normal” pre-purchase “condition and value” survey. The key point to remember is that this is a limited inspection; it’s what the market has become accustomed to paying for, and what is accepted by insurance companies and lenders. In general, the surveyor won’t disassemble permanent parts of the boat to access areas they can’t see. And it’s a snapshot of the boat at that particular moment – there’s no guarantee that an electrical component that powered up during the survey won’t suddenly reach the end of its life the next week. 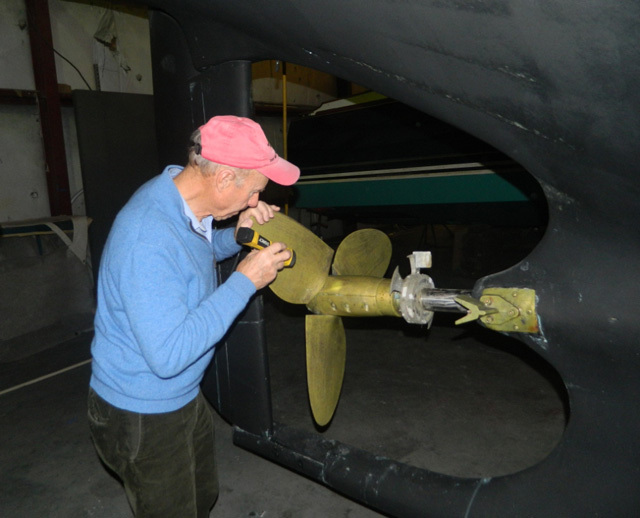 The classic survey routine for a boat in the water starts with an inspection in its slip, a short haul and bottom cleaning, a hull inspection once the boat dries, a re-launching, and finally a short sea trial. All of this is accomplished in one day on most boats, though on large yachts it may take a bit longer. Also, while the routine above may be perfect for a powerboat in the water on a sunny day in Florida, it often needs to be modified based on weather, the yard’s schedule, and other variables. 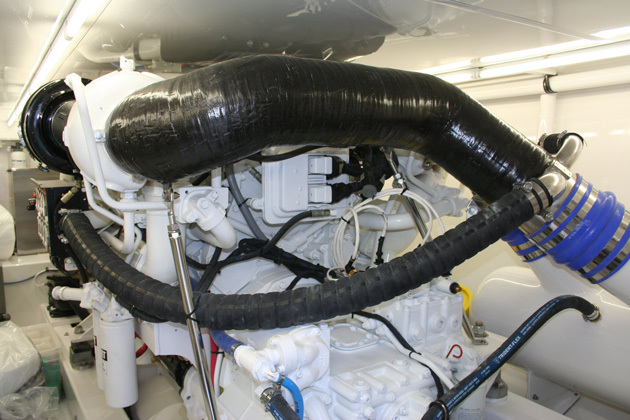 Especially on large inboard boats with expensive powerplants, an engine survey is a good idea. Another variable is that the surveyor may suggest including an engine surveyor in the process as well. This is especially common (and wise) on larger powerboats where the engine(s) are a big part of the boat’s value. And on sailboats, some surveyors are willing to go up masts for rigging inspections if the client wishes, but that adds time and expense to the process as well. The result of the surveying process will be a written report with: descriptions of the boat and each system onboard; findings and recommendations, divided into levels of importance; a statement of the boat’s overall condition; and fair market and replacement values for the boat, based on comparable sales or industry data. The report will comment on the condition of the components on the boat, and may state whether the boat is fit for its intended use, but will not (and should not) say whether the boat is “seaworthy.” The concept of being seaworthy includes the quality of the crew and its preparations in relation to a specific voyage being attempted, so it’s well outside the scope of a pre-purchase survey. This is the toughest question of all. Some surveyors use a flat rate based on the length the boat, while others use an hourly rate. Either way, a pre-purchase survey will cost somewhere around $20 per foot, but it will be higher on large and complex (or older) yachts. In some cases, it may be less. When considering the cost of a survey, don’t forget about expenses that may go with it – like a haul-out. The location or time of year may have an effect on survey pricing as well. A “short haul” during the survey to powerwash the bottom and inspect the hull could add another $14 to $19 per foot, and an engine surveyor might add approximately $500 per engine. The irony is that older boats will likely cost more to have surveyed than new ones. A 2008 36’ sailboat being purchased for $200,000 is likely to be a much easier job for a surveyor than a similar boat from 1978 selling for a tenth of the price. When you call about the older boat, either the surveyors will give quotes that reflect this, or they’ll seem awfully busy and refer you to newer, younger surveyors in the area. Whether you’re buying or selling, you want to make sure you get the most value out of a survey. As the buyer, you’ll want to let the surveyor know about any disqualifying factors and/or red flags for you—your experience and research are a key part of the process. You’ll also want to be there for at least part of the survey, so the surveyor can show you findings in person. And help if you can, perhaps by pulling gear and cushions out of areas to be inspected, but don’t waste the surveyor’s time and attention with things you can survey yourself, like fishing gear, sails in bags, and other add-ons. This may help to reduce the cost of the survey as well. Finally, write down questions to be asked when a good time arises—don’t distract the surveyor every time you see something to ask about. As the seller, you’ll want to prepare long before the survey (in the ideal world we should all be preparing to sell our boats as soon as we buy them). Keep a log with all invoices for maintenance and service work performed on the boat throughout its life—it’s hugely impressive for a surveyor to find this on a boat. But be careful about doing work on the boat yourself if it goes beyond cosmetics. As a surveyor, when you hear “the owner is very handy, and he’s done a lot of work on the boat himself,” it’s a red flag. And prior to the survey, clean the boat and remove any clutter. As with the buyer, you’ll want to be there or be available. Your broker may be the one to attend the survey, but make sure you’re available to answer questions—you know your boat better than anyone, and you may be able to clear up issues before they become misconceptions. For everyone involved, the most important thing is to hold onto perspective and your sense of humor. At some level, it’s just a boat. If we’re able to concern ourselves with boats, chances are we’re doing pretty well in life—we’re not starving or living in a war zone, and there are more boats and buyers out there if the one involved with this survey isn’t the right fit. This entry was posted in Uncategorized by Youval Harari. Bookmark the permalink.